Palak Paneer Dosa is a popular street food in Mumbai. It is an easy to make healthy tasty breakfast. When compare to masala dosa it is so healthy as it has greens in it. Its tastes awesome when consumed hot. It is a wholesome breakfast for the growing kids. 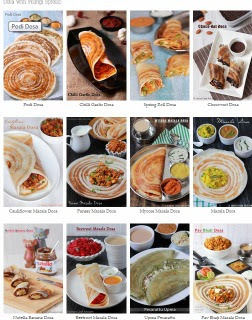 This dosa doesnot need a dip or side dish like sambar or chutney. The filling itself is enough to eat the dosa. Easy to make healthy option for a lazy day breakfast. Spinach and paneer cooks in no time and the whole dish takes hardly thirty minutes to prepare. This recipe i have seen this recipe on my my friend Poornimas page and i did not get time to refer that day. So i have done it in the same way i have prepare Palak paneer recipe but made without grinding the spinach. For the palak paneer filling, finely chop the spinach. If you use frozen paneer thaw them before hand. Heat oil in a pan once it reaches smoking hot add the jeera and wait till the roasted aroma starts coming. Now add the chopped onion with a pinch of salt and cook for thirty seconds till translucent. Add the ginger garlic paste and cook for about fifteen seconds till the raw smell leaves. Add turmeric powder, chilli powder and cook for a minute. Add the chopped spinch and cook on medium flame with salt. Once the spinach gets wilted and the juices from the greens stagnating around the masala evaporates, sprinkle garam masala and cook for ten seconds. Now if you wish puree the masala and transfer to the pan. Mix well and cook for a minute or two till the paneer get the heat and cook. In a dosa tawa add a big ladle full of dosa batter and spread to make a thin dosa. Drizzle on top with oil and cook till crispy. Turn the side and cook if needed. Fill the centre of the dosa with the spinach filling. Fold the dosa like masala dosa and serve hot. 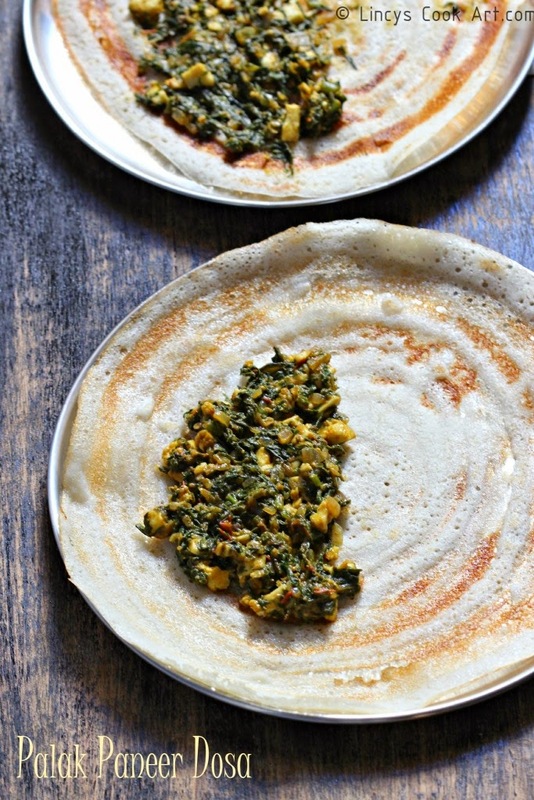 Serve with chutney or sambar if you wish but this dosa does not require any side dish to eat. this looks amazing... nice filling for dosa... I like the background, what it is, dear? That's a delicious filling.. looks yummy..